At around 9.15pm a man believed to be in possession of a blade and a claw hammer entered the Stanley Court shop and threatened staff - breaking into the till and stealing cash. He fled the scene in a car, believed to be a purple Ford Fiesta, in the direction of the Sydenham estate. No-one was injured. The man is described as between 5'6" and 5'8" tall and of stocky build. 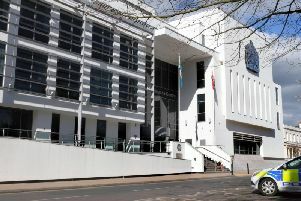 He is believed to have been wearing a dark jacket with the hood up, medium grey tracksuit bottoms, light coloured trainers, white gloves, a black balaclava covering his face, and carrying a drawstring shoulder bag with neon green strings. Detective Constable Sara Skinner of Warwickshire Police said: "Thankfully nobody was injured during this incident, but the staff were understandably left shaken. "We would therefore like to speak to anyone who may have witnessed the incident, seen the offender leaving the scene or who may have seen a purple Ford Fiesta in the area around the time of the incident. "We would also like to speak to two people we believe were parked close to the shop in a black Audi as they too could help us with our enquiries." Anyone with any information is asked to call Warwickshire Police on 101 quoting incident number 390 of 30 March.